41 - 43 High St. This Victorian brick house is similar in style to the former Punchard - Barnard house at 8 High Street built in 1848 and the first Punchard High School built in 1856. Gable end to the street, as the Greek and Gothic styles of the same period, the details were exuberant in the craftsmanship of the brickwork. Quoining on the corners of the house, railings on the porch roof and bay window and the delicate porch columns make this early Victorian home a standout on the street. Every effort has been taken to replicate the original look of the house in style and materials during its ongoing restoration. The land was once owned by William Ferguson in 1836 and contained two adjoining lots on High Street. William Ferguson took a mortgage loan from William Foster for $550 on Jan 1, 1836. Ferguson was sued by Amos Griffin of Methuen for $32 owed him by Ferguson. The courts ruled in Griffins favor and forced the sale of this lot to pay off the debt. Moody Bridges, sheriff, auctioned off the second parcel two acre lot on August 22, 1838. Charles Abbot was the highest bidder at $76. Charles then sold the lot on Dec. 5, 1839 for $88 to Herman Abbot Jr, Yeoman, of Andover and Benjamin F. Abbot, Printer, of Boston. Herman became a Cabinet Maker and Benjamin Abbot, a Physician in Melrose, MA. The 1850 Andover Valuation schedule lists Herman Jr. & B. F. Abbot with 2 acre lot $200. The 1852 map of Andover center does not show this house as built yet. It was Herman Abbot Jr. who then had the house built on this lot. Herman operated a furniture business on the site of Memorial Hall Library for many years. Herman and Benjamin sold the property was sold to Orlando S. Morse on August 23, 1855. for $1175. Mr. Morse was a contractor who opened a nursery on his 2 acre lot and built a greenhouse in 1858. He advertised fruit trees in the local paper of the period. 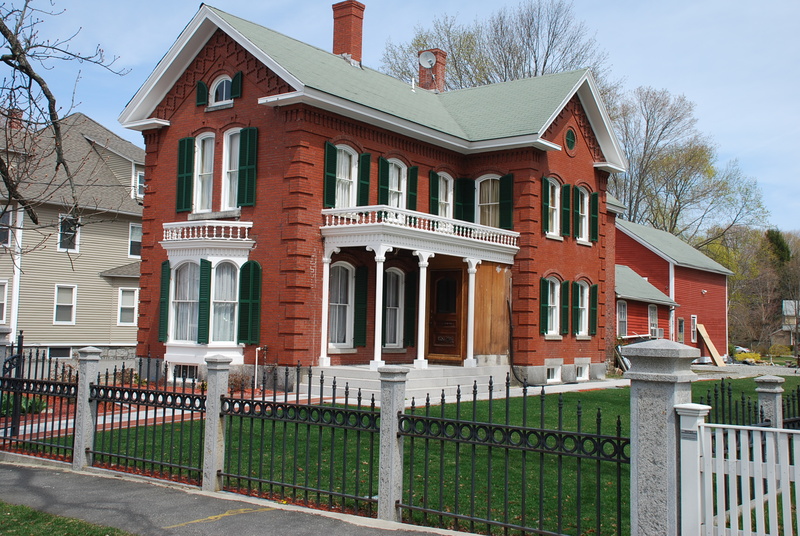 George R. Waterman and his wife Lucretia acquired the home in 1874. Mr. Waterman worked for the Pacific Mills in Lawrence. The property was subdivided during their ownership. Andover Savings Bank - April 9, 1909 - b. 271 p. 170 mtg. Andover Advertiser - April 3, 1858 – Fruit Trees – O. S. Morse – at nursery on High Street. July 24, 1858 – Orlando S. Morse – building a greenhouse at his residence on High Street. long article.